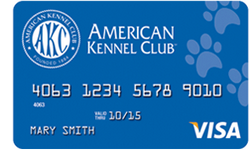 The American Kennel Club is once again offering its own official AKC Visa credit card. The American Kennel Club VISA Card offers customized card designs by choosing a design their Breed Photo Gallery, or a picture of your own dog to grace the card. Take home “Best in Show” with the AKC rewards credit card. Earn 3 reward points for every $1 spent at pet stores, veterinary offices, purchases made from American Kennel Club by mail, phone, online at akc.org or at the AKC booth at dog shows. Earn 2 reward points per $1 spent on gas and grocery purchases. Earn 1 reward point per $1 spent everywhere else Visa® is accepted. COMING SOON: Redeem reward points online for merchandise, gift cards, travel and more! For details sign in your account online and access the “My Rewards” section of the screen. Every purchase made using your AKC credit card enables the American Kennel Club to do more for the dogs who mean so much for us. Apply here for an American Kennel Club Visa credit card to get the official credit card of the American Kennel Club: it’s just that simple. There is no maximum accumulation of points earned on net new purchases per billing period or per calendar year, but the points will expire after three (3) years or immediately if the account is closed. Cardholders can view their program activity at www.comenity.net/akc to find out the number of unused and unexpired Points in their points balance and any redemption activity. If a computer is not your choice of communication you call the bank at 1-855-463-0225 for AKC Visa Card or 1-800-224-1860 for AKC Visa Signature Card for information. Technically points are not the cardholder’s property, so points cannot be transferred to anyone else, even among different AKC credit card accounts. Along with its more than 5,000 licensed and member clubs and its affiliated organizations, the AKC advocates for the purebred dog as a family companion, advances canine health and well-being, works to protect the rights of all dog owners and promotes responsible dog ownership. Affiliate AKC organizations include the AKC Humane Fund, AKC Canine Health Foundation, AKC Reunite and the AKC Museum of the Dog. For more information, visit their web site at www.akc.org. To get the latest news and become a fan of the AKC on their Facebook page. You can also follow the AKC on their Twitter account. I would like to customize my current AKC Chase credit card. Right now I have a Maltese on it, but I would like my own Maltese picture on it. Is that possible? Short answer: no. Currently AKC images available are only stock photos from the AKC. There are are other credit card options available for customizable and unique, that is one-of-a-kind credit card images that no else has. Those will not have the loyalty to the AKC. even shorter answer. CHASE and AKC have now divorced. Chase will still offer your card with the same number, but it will no longer be affiliated with AKC after Oct 31, 2013. Probably won’t have dogs on it either. Very upset that Chase is ending its relationship wit AKC. Really loved the fact that I had my choice of dog breeds placed on my card and the affiliation with AKC. Will be transferring to another Bank..
Will AKC be partnering with any other credit card company? I really don’t want wo give up my Yorkie credit card! I too don’t want to give up my three Basset Hounds credit card. Does anyone know of a similar offering from another credit card provider? I am working on finding out about the future of the AKC credit card. The AKC is hurting money-wise so stay tuned if they can even remain in business. I want desperately to find another credit card company that offers dogs, preferably Labs on their cards. I love the idea of having my best friend on my card. Many years ago U had my Yorkie, now I have my Lab. Please Chase use dogs or someone lead us to a bank that offers dogs on their cards!! Several cards such as Capital One and Wells Fargo would allow you to put a pix of your best friend on their card. While these cards not affiliated with the AKC at least you could have a picture of your Lab on your card and it would be the only card in the world with that picture. Where is application can’t find it. American Kennel Club is exploring new partners for its credit card, so currently the AKC does not offer an official AKC card. However if you want a picture of your pooch on a credit card, you put it on cards that offer custom picture options such Capital One or Wells Fargo. Is AKC affiliated with any other credit card companies? The AKC seems to gone a different route with credit card affiliations. It is now promoting Cherrybrook Pet Supplies as seen on it’s home page http://www.akc.org with a link to Cherrybrook at the bottom. Currently AKC is not affilated with any credit card issuers. I am truly upset to see a new ‘blue” run of the mill credit card from Chase bank with a letter saying they are no longer affiliated with the AKC and the photo of standard poodle puppies can not be transferred. Big Mistake and disappointed in this outcome. Looking for the AKC to reaffiliate with another card company in the future. Then the new Chase card will go bye bye.